Is your vacuum advance suitable for my distributor? The vacuum advance unit that we supply for the Lucas Rover distributors will fit all of the distributors fitted as standard to the Rover V8 engine. 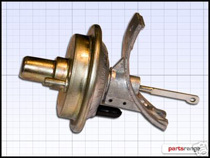 Over the years there have been many types of Lucas distributor used on the Rover V8 engine, however, the vacuum advance unit has always connected internally in the same way, and its mounting screws have also never changed. For sure, Rover may have given it a few part number changes, but all are superceded by the one that we stock. If you have upgraded to one of the Mallory distributors, then we do also stock the Mallory vacuum advance unit, as this is specific to Mallory, and the Lucas Rover unit will not fit. Vacuum Advance unit suitable for all Lucas Rover distributors. You should also consider some essential upgrades that we make to the Rover Ignition system, as efficiency and performance can always be improved. More information can be found on these upgrades here Magnecor Plug leads and here RPi Power amplifier & Mallory Distributors. The vacuum advance unit along with other items are available through the Ignition section of our eBay shop.